1. How to find the status of my order? 2. How long does it take for my order to ship out? 3. Can I clean my Sky Dancer? 4. What is a SkyDancer and how do I utilize my Sky Dancer for the best results? 5. Can I become a reseller of Sky Dancer products? 6. Do we offer price matching? 7. What size blower fits with my Sky Dancers? 8. What is the difference between a regular blower versus the weather-resistant blower? 9. What is the difference between a ground-spike pole set and X-stand pole set for our feather flags? 10. I just received my feather flag pole set, I don’t see any instructions, how do I install it? 11. What are SkyDancer’s made of? 12. Do you offer warranty on your products? 14. Can we make a custom Sky Dancer? 15. Do we ship outside of the U.S.? You will receive an email directly from UPS with tracking information once your order has shipped. Allow one full business day for your order to ship if placed online or by phone after 2PM PST. If it has been over one-business day and you have not received tracking information, first, check your spam folder for the UPS email. Sometimes, tracking information can be automatically placed into spam folders. If you still have no tracking information please email us sales@skydancers.com (Please make sure to reference your order number and the name the order was placed under). We will contact you with your tracking information immediately. Orders that are placed before 2PM PST will ship out the same day they are placed. If you place an order after 2PM PST your order will ship out the next business day. Please make sure to contact us if you need expedited shipping, all orders placed online are UPS Ground shipping by default. For deadlines that are urgent, please specify in the “Notes” section in checkout. You may also email us, sales@skydancers.com and notify us of your rush order. Please state your name (first, last) which the order was placed under or your invoice number. We suggest washing our SkyDancers using cold water and placing it in a front-loading washing machine. Make sure to use a small amount of detergent, so you keep your Sky Dancers looking clean but making sure not to use too much detergent (non-bleach) to prevent fading or discoloration. After washing, hang dry your skydancer only (do not use dryer). A Sky Dancer is an inflatable dancing tube that generates attention to your business by its dancing motion! Customizing your inflatable is a great way to make sure your business is noticed! We suggest placing your skydancer in a safe and wide-open area, making sure it is viewable from many sides as possible to generate attention from all angles. Yes, we appreciate business from our customers who want to become resellers. Our reseller discounts offer even more affordable pricing when you purchase (units) or more. 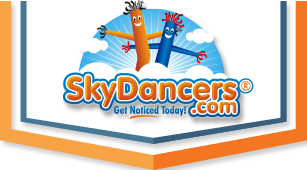 At SkyDancers.com we guarantee our product is the highest quality out there, we offer price matches on comparable products. When ordering your Skydancers or blowers, you want to be aware of which skydancers and blowers pair together. The dimensions are specifically meant to fit certain sizes. 9” Diameter blowers pair with 6FT SkyDancer 12” Diameter blowers pair with 10FT SkyDancer 18” Diameter blowers pair with 20FT SkyDancer. Our blowers are both made of the highest quality and are both made to be used outdoors. The only difference between the weather-resistant and regular blower is a weather-resistant blower has an encapsulated motor along with encapsulated electrical components, making it water-resistant and can be used outside in rain. We suggest bringing in your regular blower if it begins raining because getting it wet can damage its electrical components. Ground-Spike pole sets are made to place your feather flag in areas where dirt or grass is. Ground-Spikes go 18” deep into the ground and will keep your feather flag securely in place. X-Stand pole sets are used to place your feather flags on concrete, solid ground or indoor areas. The X-Stand is made to keep your feather flag in place offering a strong base as support. In your package you will have three straight poles with different widths (including: an arched pole and either a ground spike or X stand). The easiest way to assemble your set is starting with your straight pole that has the largest width and placing it at the bottom. Next, place your second widest and connect it to the base. Lastly, the most place the narrowest pole at the top. Place the side of the feather flag that has the sleeve running down the entire side. Slide this side into the top of your pole and thread it all the way through to the bottom. Once you have the 4 piece pole and flag connected, insert the completed piece into the ground spike or X-Stand and assembly is complete. Our Sky Dancers use a long-lasting material that is non-tear nylon based material with added tarpaulin. This material allows our skydancers to have flexibility with a long life span. We offer warranty on all of our Sky Dancer attachments. Your skydancer is covered under warranty up to 3 months from your date of purchase. All Sky Dancer blowers are covered up to 1 year, limited warranty. This warranty only covers what we consider to be a manufacturer’s defect. Our warranty only covers what SkyDancers.com considers a defect. We reserve the final right to grant any warranty approvals. Purchaser is responsible for all warranty return shipping. Warranty claims will not be approved for negligence, misuse and error from user. Approved warranty claims will be reissued a new unit. All of SkyDancers.com products are quality inspected and tested prior to delivery. We will accept products that are unopened and unused within 7 days of your product arrival date. Customer is solely responsible for shipping unused products back. Email sales@skydancers.com or call (866)976-2661 for all returns. We can create any custom skydancer with any custom lettering and logo. If you cannot find any in-stock custom skydancers on our site and want a custom give us a call (866)976-2661. Let us know what you are looking for and we will put together a quote and be able to create a proof once an order is placed. Feel free to also chat with our customer service associate, click the chat button located at the bottom right of your screen. We’ll be more tan happy to help you with all your questions and needs. Our website only allows customers to ship within the U.S., for shipping elsewhere please contact us through chat, sales@skydancers.com or give us a call (866)976-2661. We will need a physical shipping address to provide you with a shipping quote, if you want to place an order and have it shipped outside of the U.S. orders will need to be done over the phone.